Persistent sinus bradycardia is not usually an acute problem and mostly reflects one of three things. Firstly, a very fit person – someone who runs regularly – will have a low resting heart rate. Champion cyclists, for example, can have a normal resting heart rate of 28bpm. Secondly, this may reflect drug treatment. B-Blockers are the obvious candidate, but Verapamil, Diltiazem, Amiodarone and Propafenone (amongst several others) can also cause this. Finally, sinoatrial disease may present with an inappropriately low sinus rate. An 80-year old diabetic female is unlikely to cycle 20 miles a day and a resting heart rate off drugs of 45 bpm may represent early sinus node disease. If a 24-hour Holter monitor demonstrates poor heart rate variability throughout the day, this ‘chronotropic incompetence’ may cause fatigue and exercise incapacity and in this scenario may benefit symptomatically from permanent pacing. 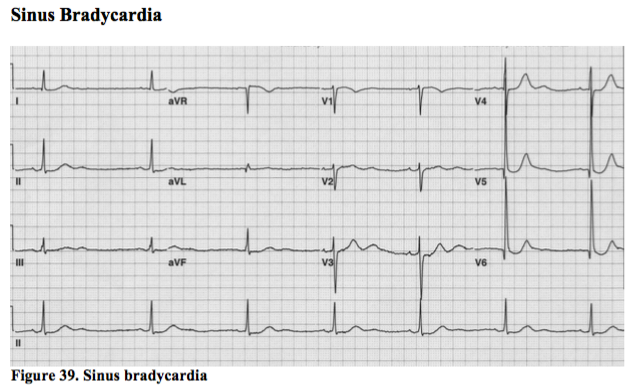 Sinus bradycardia can also occur transiently as a vagal phenomenon and usually responds to atropine.